Dileep Show 2017 was one of the prestigious show of Blue Sapphire Entertainment. It was completely a power packed, fun-filled sold out show in Canada. This programmedwas directed by "Nadirsha", a versatile artist, well-known comedian, music composer and director in Malayalam. The name of the show itself revealed the importance of our popular & favorite “JanapriyaNayakan Dileep”, who has been in the industry for the past 25 years. He was the main attraction of the show along with other multi- talented artists like Kavya Madhavan, Namitha Pramod, RimiTomy, Swasika, Ramesh Pisharody, Dharmajan, and other well-known mimicry artists from Kalabhavan to entertain the malayalam community across Canada. BSE got so many appreciation for bringing such kind of versatile show. It’s a tribute show done by Blue Sapphire Entertainment to “The complete Actor & South Indian Superstar Mohanlal for his 35 years of contribution to the Malayalam Industry. The programme was led by Prominent singer & National Award winner Shri.M. G sreekumar and Remya Nambeesan, the famous South Indian actress and a well-known dancer, Ramesh Pisharady, a versatile comedian and Sithara Ramakrishnan, a trendsetter singer and a group of other talented artists. The programme was held at Global Kingdom Ministries, Scarborough on 29th October 2016.The presence of Honorable Member of Parliament Shri.Ramesh Sangha escalated the joy of each artists and MP gave the certificate of appreciation to shri.M. G sreekumar for his music contribution to the Film Industry and For Padmashri Mohanlal for his three and half decades of Contribution to the Malayalam film fraternity. Blue Sapphire Entertainment also privileged to get a certificate of appreciation from the Canadian Government for promoting South Asian Culture. 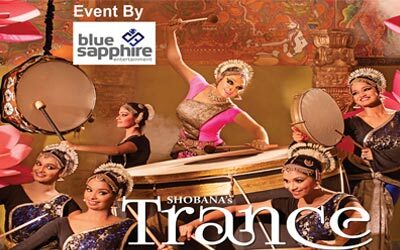 Blue sapphire Entertainment proudly presented their debut show “Shobana’s Krishna” in GTA in an overcrowded theatre(The Meeting House) , Oakville in October 2015. That was an awesome day of many of Torontonians who witnessed the story of Krishna from his birth to demise. This play of epic proportions brings to life all the nine rasas and bhavas (moods & expressions) while unravelling the ever-enchanting story of Krishna. This performance about eternal love and wisdom performed through charming dance and music and have enthralled the audience by evoking the profound relationship between human beings and nature, the varying hues of seasons. The English version of Krishna has been conceived and created by Shobana after long years of research, training and practice. The role of Krishna is played by Shobana accompanied by a group of 16 artists including her daughter Narayani.Though the story of Krishna has been told in several languages, this was the first full- fledged song and dance performance on Krishna in English. With regard to the musical score too it weaved together melodies from Carnatic Classical, along with music and songs from Hindi, Tamil and Malayalam. Popular film songs composed by the illustrious music director, A. R. Rahman forms the musical theme of the dance drama. The sound mixing was done by the Oscar winner Rasool Pookutty. The voice of the characters was rendered by some of the best-known film actors from India; Surya for Arjuna, Konkana Sen for Radha, Shabana Azmi for Gandhari, Shobana for Draupati and actors like Andrea Jeremiah, Sukumari, Prabhu, Nanditha Das, Radhika lent their voice to the other characters in Krishna.